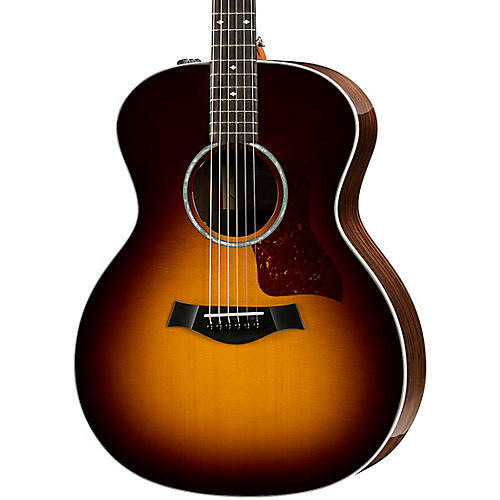 For pros or beginners on the hunt for a versatile sound and a comfortable playing experience, the 214e DLX acoustic-electric represents an ideal match. Taylor's flagship Grand Auditorium has physically appealing body contours creates an acoustic sweet spot, where tonal depth, balance and clarity converge. The 214e DLX has a solid Sitka spruce top paired with layered rosewood back and sides to produce a sound with a smooth blend of top-end shimmer, well-defined mids, and rich bass that suits most playing styles. Onboard Expression System 2 electronics amplify the natural voice of this guitar with clarity and projection, and deluxe appointments like white binding, Small Diamond inlays, and a full-gloss body make this guitar worthy of showing off. The 214e DLX guitar ships with a deluxe hardshell case.